The first two items can be easily procured at any storage facility, like Public Storage, Shurguard, or Door-to-Door Storage. I won’t tell you where to find a pair of scissors because you probably have one already. You know that annoying bike number that’s usually mounted around your top tube? Or sometimes it’s a strip that’s intended to wrap around your seat post. If you try to attach it the way that it’s intended to be attached, it will leave a big number flapping in the wind– aesthetically unappealing both to you and the wind. Plus, it will likely leave a mess on your bike when you take them off. Here’s how to clean up this mess. First, trim around the number. No one says that your race number has to look pretty or be intact– it just has to be on your bike when you put your steed into transition. Next, wrap your seat tube with some shrink wrap. 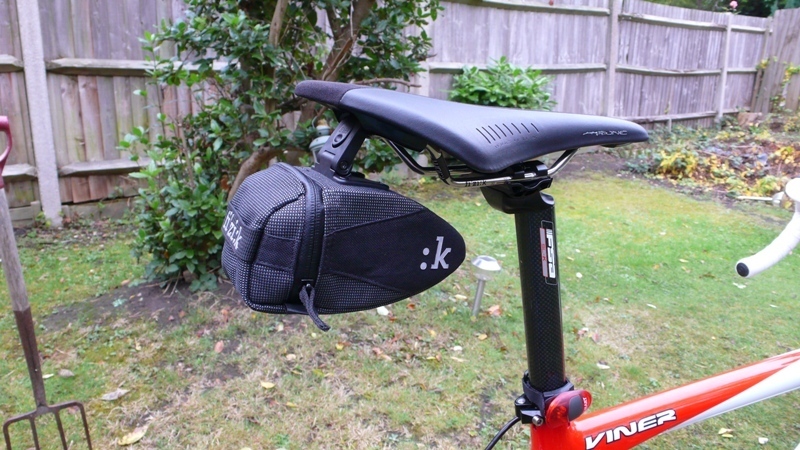 This prevents the gunk from getting on your seat tube. Lastly, tape your number down with some clear plastic tape and attach it directly over the shrink wrap you put down earlier. Apart from the clean aerodynamics you’ll get from taping down that number, the biggest benefit that you’ll get comes after the race. Removing your number comes down to just cutting through the plastic wrap and, voila, you’re bike is as good as new. Plastic wrap doesn’t work out so well on your helmet. But that helmet number can leave the messiest sticky goop on your helmet. The trick to preventing that from happening is to put down a piece of clear packing tape on your helmet first and then sticking your number onto that tape. 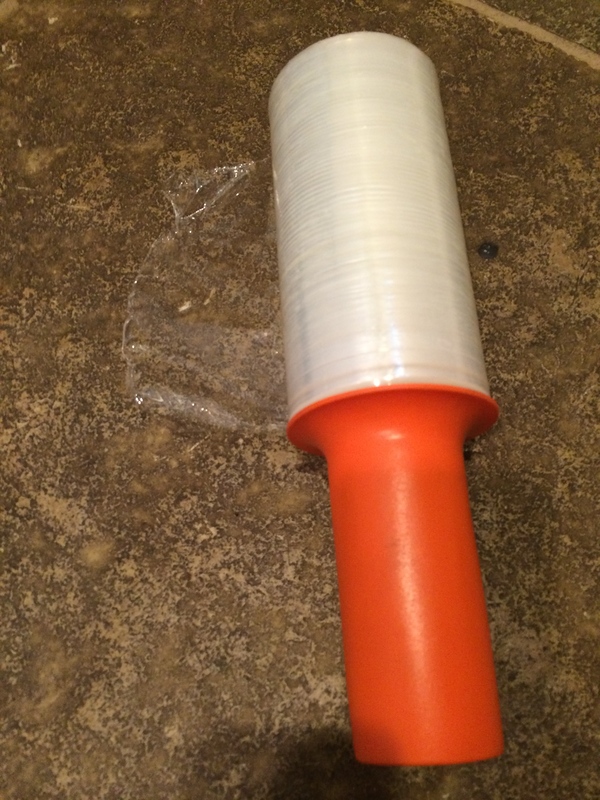 It also helps to fold over the end so you can pull off that packing tape without it tearing off in strips. Sorry I don’t have any pictures of these first two tricks right now– I haven’t raced a duathlon in a few weeks. I’ll try to update this post with some pictures the next time I do. You know that flat kit you have on your bike? As nice as it is for training, it’s not the coolest thing to have on your bike on race day. It’s also not particularly aerodynamic. 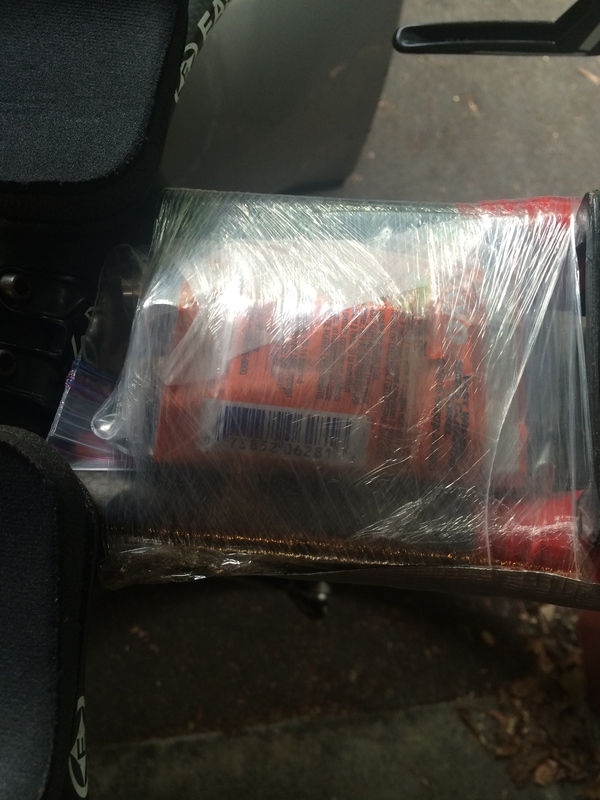 Instead, just place the contents between your aerobars and wrap it up with some shrink wrap. At least for this trick I’ve got some photos of the end product.